What is a Mother Buddy? We are working to see children born HIV-free, to help keep parents alive, and families together. The main way we do this is through our Mother Buddy programme in Malawi. The programme trains up local women living with HIV, who have given birth to HIV-free children, to become ‘Mother Buddies’. Through this comprehensive training and their personal experience of the benefits of treatment and care, these empowered women are saving lives every day. They are having an amazing impact in their communities and we celebrate that more children are being born HIV-free, and that mothers and children are able to lead full and healthy lives. Our Mother Buddies come alongside pregnant mothers living with HIV – providing practical advice, emotional support and counselling. Their role is critical in preventing complications for both mother and child and can reduce the risk of HIV passing from mother to child to below 1%! Mother Buddies – equipped with smartphones – achieve fantastic results! We have now proven that the Mother Buddy approach works! Pregnant women helped by Mother Buddies do better than similar women not helped – a new report shows statistically significant differences in terms of knowledge, attitudes and behaviours! All of this empowers local women to care for themselves and their children, giving entire families and communities the opportunity to thrive as the effects of HIV are reversed. 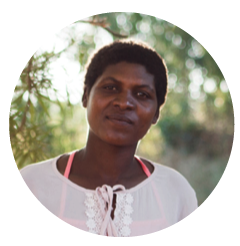 Emma has four children of her own and is HIV positive, and she has given birth to HIV-free children. When Emma discovered she was living with HIV, her husband refused to be tested and abandoned her. He left her, to fend for herself and their four children. She now provides support, advice and counselling to other mothers in her community. For these mothers, she is the difference between life and death. The work of the Mother Buddies is changing and saving lives everyday. You can provide one family in Malawi with access to a Mother Buddy by twinning or sponsoring a pregnancy – helping keep mothers alive and their children born HIV-free.